Pack reporting is a part of the XivoCC. It aims at computing historical statistics, which are stored in the xivo_stats database. Sample reports based on them are accessible in SpagoBI. Queue members should only be agents. If users are members of a queue, their statistics will be incomplete. Configuration modifications on the XiVO (such as an agent deletion) are replicated on the statistics server, and their previous value is not kept. However, statistics history is preserved. POPC statistics are not accurate. Calls longer than 4 hours are considered as unterminated calls and therefore communication time is set to 0 for these calls. If two agents are associated to the same call, they will have the same hold time for this call. Given two queues Q1 and Q2, two agents A1 and A2, and an external caller C.
Given one queue Q1, Two agents A1 and A2 and an external caller C.
Then the call between A2 and C is not computed at all in statistics. The pack reporting allows to attach as mush data as wished to a given call, in order to find them in the reporting database for future use. This data must be in the form of a set of key-value pairs. You may use Jaspersoft® Studio to design you own reports. Due to a limitation in SpagoBi do not use single quotes in your reports name, otherwise you will not be able to schedule your report (see #213). 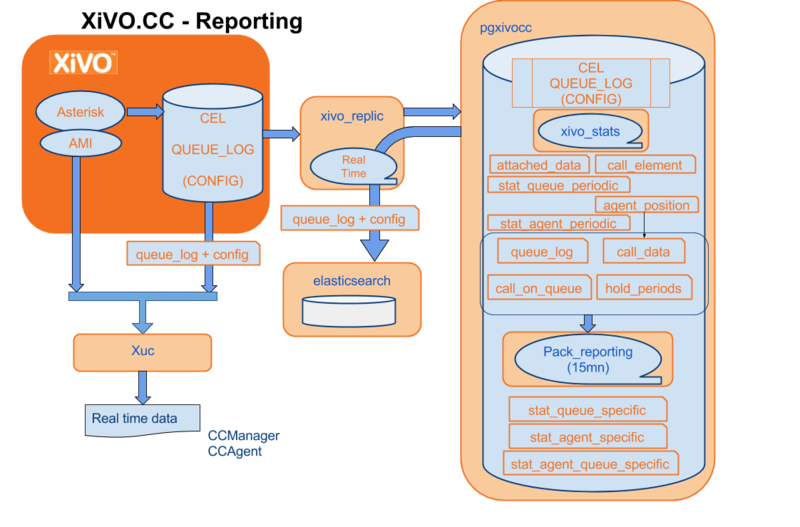 Graphs are based on the queue_log table, enriched with agent names and agent groups, and inserted into an Elasticsearch index. It contains avents about calls placed on queues, and events about agent presences. unqiueId are Ids generated by asterisk for each call leg. When A calls B we get a call leg for A and one for B, each one is a separate uniqueId. in cel asterisk table you can find all event linked to a call leg by looking for it in the column uniqueId . the column linkedId in cel Asterisk table contains a uniqueId which links the two legs of the call. The leg which initiates the call (A leg) will have the same value for both uniqueId and linkedId columns. The other leg (B leg) will have the uniqueId of B in uniqueId column and will have the uniqueId of A in linkedId one. Each line in call_data , correspond to a unique call and contains only one uniqueId of one call leg. This table is aggregated in near real time with the data of cel Asterisk table. End of a call is considered when phone is hung up, we don’t consider the time of transfers that can be done besides initial call. status status_type Call status. Beware: only answered is properly filled. in the table queue_specific_time_period for the default values in seconds. Installation values are t1=15 seconds and t2=20 seconds. Data is saved in the form of (name, seconds) pairs, for example : (‘t1’, 15). in the table queue_threshold_time for values specific to a queue. Data is saved in the form of a tuple (queue name, t1, t2). Hold times are considered as conversation time and so are included. This section gives an overview of what kind of data can be found in the different statistics tables when performing usual contact center call flow. Let’s take the assumption that one Agent ( A1 with id 8000 and phone number 1000 ) calls an internal User ( U1 with phone number 1001 ). We don’t consider the time of the transfer besides initial call and only time of established calls. Conversation time can be over 900s (15mn) as hold time is included in this specific call flow. This section describes some SQL query achievements done based on Database schema. This query get the phone set number on which the agent took the call. It lists all calls answered by agent with line number on which he was logged in. The query here is limiting to all calls answered the first day of August, but it can be easily customized to your needs. This query aggregates all received call by month and by direct inward dial number. On the other hand, tables attached_data and call_element contains foreign key referencing the id column of call_data.